I write, I’m not a great or even a good photographer. 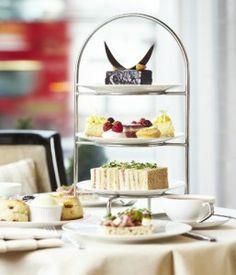 But tea at the Ritz needed to be remembered and I wanted you to see something! Halfway through our afternoon tea, Plays with Fire, as I affectionately call my main squeeze, snapped a picture. Now, it is my belief that the Ritz understands the concept of “a little touch of something” very well. For two hours we didn’t gorge, but nibbled on works of art that also tasted terrific. At 2:30 in the afternoon, it is unnecessary to feel “stuffed” when you leave. Notice the empty champagne flute on the left. The Royal Tea begins with a fruit infused glass of champagne~smell~. I ordered the champagne of teas as well, the Darjeeling. 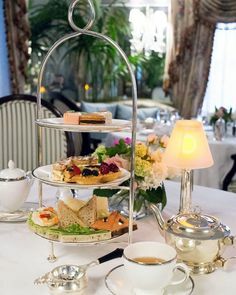 Note: the Ritz limits their tea choices to about ten with only one subtly-flavored black included. Now, I enjoy flavored blacks most of all~but when the food is filled with excellent flavor, flavored blacks are over-kill. My husband ordered the Ceylon. Now, this picture only shows about a third of what we were served (on beautiful Wedgwood china, I might add). 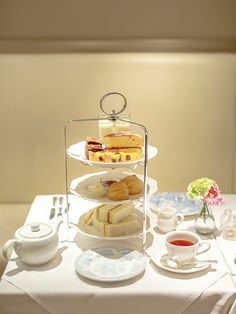 We were each given a half dozen tea sandwiches, scones, the four desserts you see on the bottom plate, and my favorite~fresh strawberries and cream drizzled with Grand Marnier for the finale’~taste~. Bon Appetit’! I love the white linen~touch~, heavy silverware, fresh flowers~sight~ and Wedgwood china. I love that the atmosphere was manly enough for my man and elegant enough for me (the live piano~sound~, of course, is a wonderful addition). For a true, transporting experience~all five senses need to be wooed. Their only flaw? My husband was the only one to order the Ceylon that day and they don’t decant their leaves. 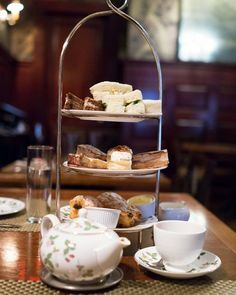 While the servers are extremely attentive to a full tea cup, my husband couldn’t empty the pot by himself and his brew was bitter. Still considering ourselves tea novices, we didn’t say anything until the end. Live and learn~!